There are many different ways to work out whether you're compatible with someone or not and one of those things is to compare your music tastes. 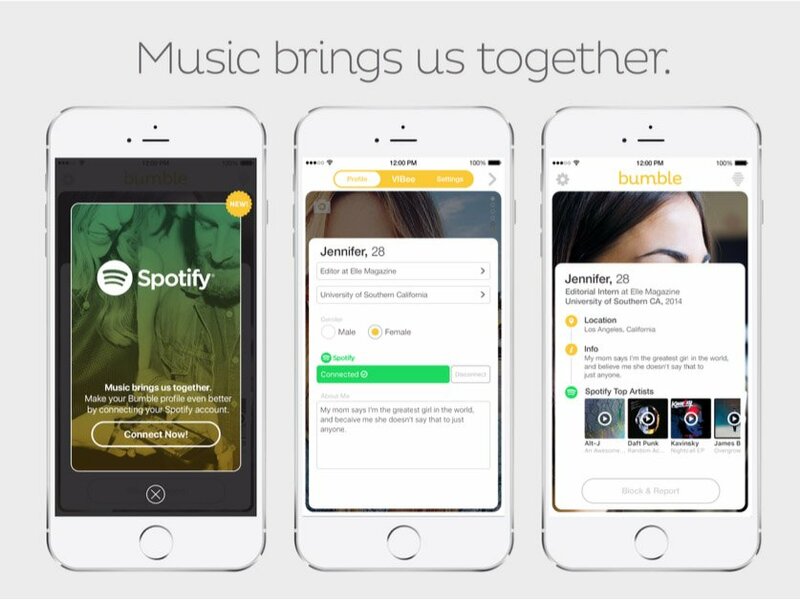 Bumble seem to have realised that and have partnered with Spotify so that their users can share their music tastes. Spotify is a pretty big service that a lot of people use to stream music regularly, but it's not one you expect to use to meet people. Bumble, on the other hand, is a dating app, one aimed at putting the woman first, which is supposed to make it less of a hookup app. This new attempt at matching people should actually help reinforce that. When a user now links their account with Spotify, other users will be able to see the top artists they listen to on their profile. From this someone might decide that you're the perfect person to go to gigs with and are therefore a great match or they might decide that actually, you won't have very much in common. These artists can also work as a great conversation starter as you can always ask for their opinions on that artist. The most interesting thing that this partnership is providing though is that Bumble will suggest the users with similar musical tastes to you first. This partnership has been on the cards pretty much since Bumble was founded. The CEO of Bumble, Whitney Wolfe has said that music can tell you a lot about someone as it either reinforces your opinion about someone or changes it. It took over a year of discussion before Bumble and Spotify settled on a deal and at first that was going to be a list of your favourite songs on your profile, but that didn't seem quite right to Wolfe. They changed it to favourite artists as they consider that a more overarching idea. After all, someone can adore a single song by an artist but hate the rest of their music. Bumble are going to looking into more partnerships after this. Now that they've added in another way to see how compatible you are with someone they want to improve the dating experience as well. They're looking into partnerships with ride-sharing services and local restaurants so soon you might be able to rely on Bumble for almost everything when it comes to meeting someone new.